How To Buy The Best Electric Heater - Which? Looking to buy an electric heater and already know which type you want? Go straight to our table of the best electric heaters, where we reveal which models are quick to heat up and won't rack up your energy bills. Fed up with feeling cold indoors but not sure what you want? Check out our full range of electric heater reviews or read on to learn more more about the types of electric heater available, how much to spend, and why you shouldn't always trust manufacturers' power claims. What types of electric heater are there? How much do you need to spend to get a decent electric heater? How much do electric heaters cost to run? Can an electric heater help reduce your energy bills? How powerful does a fan heater need to be? Are there any dangers to using an electric heater? What’s so portable about portable heaters? These are the lightest and most portable type of heater. They’re great if you want to heat a room fast, as they warm up quickly. They’re also easy to set up first time round - usually you just take the fan heater out the box, plug it in and you’re ready to go. On the downside, this type of portable heater can be quite noisy. 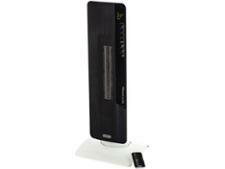 Convector heaters are quite tall, but are usually thin and light - making them easier to move from room to room. Like fan heaters, they heat up quickly - but they are quieter. Convector portable heaters are often wall-mountable, which means they can be located out of the way. Brackets and instructions for wall mounting are usually included, but you do need to drill holes in your walls. Oil-filled heaters tend to be cheap to run, but some can be really slow to heat up after switching them on. Most oil-filled heaters are fairly heavy and cumbersome, so look out for models that come with wheels as this makes it easier to move them around. 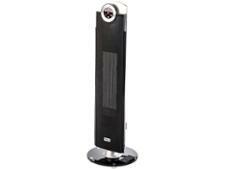 Electric heaters vary in price from about £10 for a small basic one, all the way up to £300+ for more powerful and advanced models. Most portable heaters tend to fall at the lower end of this range - you'll find lots of choice in the £20-£80 price bracket. Many of the more expensive models come with extra features, as well as looking a bit smarter looking than cheaper heaters. Scroll down to see a round-up of the most common features you should look out for. The good news is that our extensive lab tests of electric heaters have shown that you don't have to spend hundreds to get a model that heats quickly and efficiently. Our latest electric heater tests uncovered an excellent model for less than £60 that beat heaters more than double the price to make our best portable heaters list. A timer is useful for setting a heater to turn on just before you get home or wake up, so there's no waiting around for the heater to warm up. Some models also include frost protection, which means the heater can be set to automatically heat when the temperature drops below five degrees. Some fan heaters can help cool you down too. They're not nearly as effective as a dedicated air conditioner, but a light breeze of cold air is better than nothing. Climate control is a useful feature to have - your portable heater will heat the room, and when the desired temperature is reached, the heater will try to maintain the room at that temperature. Every heater we review has a star rating for how well it keeps the room temperature stable, so that you can buy a model that doesn't have you manually turning the heater on and off every five minutes. Below is a round-up of some of the best performing heaters we've tested. This heater scored extremely well in our tests and was one of the quietest heaters we've tested. It heats the room in just 10 and a half minutes and does so efficiently. 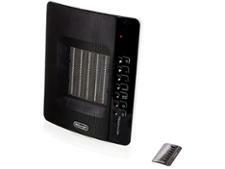 This stylish and portable heater performed great in our tests, heating up quickly and efficiently. It also has plenty of extra features such as digital controls, a remote control and a timer. This heater did well enough in our tests to earn a Best Buy. It'll heat a room quickly and does a great job at maintaining temperature in mild, cold and very cold conditions. Need something small? Make sure to check out our electric fan heater reviews to find something that suits you. 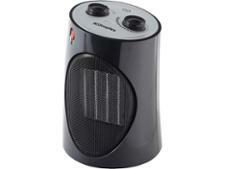 Running costs for portable heaters can be very low. A 3kW heater operating at maximum power for one hour will use about 3kW of electricity, costing you 49.2p to run. Generally, the higher the power, the more expensive the heater costs to run. But if you choose a high-powered heater that warms your room up quickly and then switches off, it will use less electricity than a heater that takes longer to warm your room. The quickest Best Buy heaters we've tested were able to raise the temperature of our test room in less than 10 minutes - the worst took more than 30 minutes. You can use our tests results to see whether it would actually end up costing you less to buy a heater with more power. A heater with an effective thermostatic control will also save you money. This is because it will turn on and off only as required, so won't waste electricity but will keep your room at your chosen temperature. Portable heaters allow you to heat just the space you need to be warm, and not your entire home. This means they can actually work out cheaper than putting the central heating on - especially if your heating system doesn't have individual room control. Depending on the size of your home, it may be more economical to set the main central heating thermostat to low and use a portable heater in the living room, for example. This means that your living room is nice and warm as you snuggle up in front of the television, while hallways and bedrooms are maintained at a comfortable temperature. Our experts test electric heaters in laboratory conditions to find out exactly how long each one will take to heat your room, how well they maintain that temperature and to see what they're likely to add to your electricity bills. Only electric heaters that heat quickly, consistently and cheaply are awarded our Best Buy status. See our round-up of the best electric heaters. Another important consideration is the power of the heater. Measured in kilowatts (kW), higher power means the heater will be better for heating big rooms. If you want to heat a small room, a good, low-power portable heater (less than 2kW, say) will be fine – and cheaper to run. However, manufacturers’ claimed power is not always what it seems. We've found that some fan heaters don't match the power that they say on the box. This means that you could end up with a model that leaves you shivering in a cold room for longer than you had expected. We test each heater to see whether it achieved the full claimed power. The only way to find out if you'll get the wattage that you pay for is to see our electric heater reviews. Unsurprisingly, our tests show that heaters get hot! But as long as you use them according to their instructions, they are safe appliances. Nearly all have some kind of carry handle for moving them about, and many have a safety cut out feature - this will switch off the heater if it gets dangerously hot. Never place anything on, or cover up, a portable heater as it massively increases the risk of a fire. Some heaters also have a ‘tilt protection’ feature – if the heater is knocked over, it will automatically switch itself off. It's worth considering this feature if you have a large, enthusiastic dog. Portable heaters aren’t the trendiest looking household appliances but, all credit to their designers, some of the latest generation have a hint of style about them. For example, the Dyson Hot and Cool AM09 has a distinct futuristic design and comes in multiple colours to suit your room. Check out our full review to see whether it heats well too, or if it's a case of style over substance. Most are lightweight so can easily be moved from room to room. Heavier models often have a carry or tow handle and wheels that allow you to easily move them about. All the portable heaters we've tested and reviewed are mains operated. Most have a cord that is over 1.5m – so you have more flexibility about where in a room you place the heater. The smaller, lighter ones are ideal if you have a caravan or mobile home. We weigh every heater we test so you can ensure you choose one that you can manage. Find out the weight of each one on the tech specs page of each of our electric heater reviews.